With Valentine’s Day fast approaching, those looking for love might turn to Tinder or Bumble, or any other well-known dating app for a chance at finding that special someone. There is, however, one big problem with many of the major dating apps that have sprouted up to mimic the success of Tinder’s swiping platform: You can swipe for hours, days, weeks — get plenty of matches — and still maybe never actually go on a date. Throw in a millennial mindset trained by Netflix to swipe through endless options, and you might be swiping for eternity. That was the inspiration behind Bounce, a dating app co-founded by siblings Dylan and Laura Petro. Bounce is designed to shorten the time from match to date by putting the time of the date at the heart of every match. Instead of endless swiping, users are invited to join once-a-day “sessions” where love-seekers have limited time to pick a neighborhood and a time they are available. 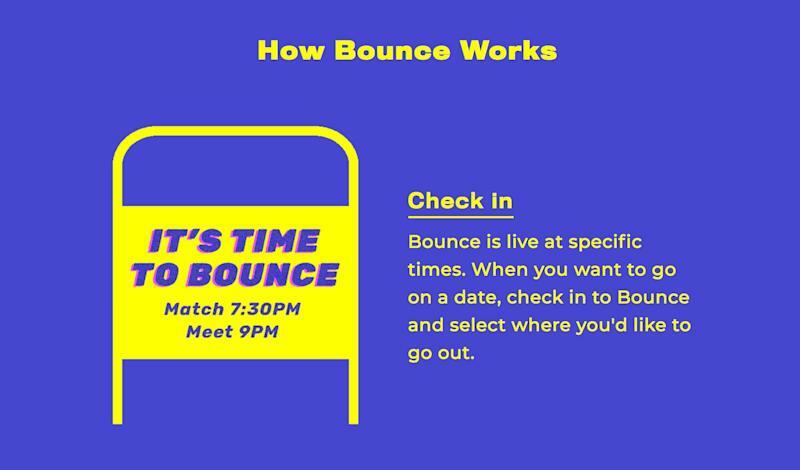 If a match occurs, Bounce picks a spot in the neighborhood and off the date goes. After about a year of development, Bounce was launched in New York City in 2018. By tieing the first date to a specific time and neighborhood, Petro said the app has driven a higher percentage of dates from matches. “We’re actually seeing people when they match with someone... going on the date about 70% to 75% of the time,” he said, adding that users who cancel more than once are normally suspended from the app. “It’s a very active intentional experience we want people to treat it that way,” Laura said. Bounce only allows a user to cancel a date once before an account can get suspended. The result is an experience that is quite different than other dating apps, and potentially from a business standpoint, more monetizable. Like Dine, a competing dating app that lets users search restaurants and helps find matches to accompany the meal, Bounce has some say where a date potentially took place. Perhaps down the line, restaurants or bars could pay to be featured, which could be an additional line of revenue beyond just advertisements. “If you match with someone, we send you to a place based on what we think is cool,” she said. For now, Bounce is only available in New York City, though the duo and fellow co-founder Adrian Diaz are looking to expand the self-funded dating app to other cities shortly. As the startup learned from their own survey , there’s no shortage of people looking for a new experience. “Despite being the number one way that people are setting up first dates, dating apps are one of the least preferred ways to date,” Laura said. Zack Guzman is the host of YFi PM as well as a senior writer and on-air reporter covering entrepreneurship, startups, and breaking news at Yahoo Finance. Follow him on Twitter @zGuz .